Tadzhidin: "We Were Two Families, and Now We're One"
In 2012, as the civil war spiraled into its second year, there was a giant explosion in Damascus near the school attended by Tadzhidin’s children. More than 100 people were killed or injured in the blast, including seven children who died, Tadzhidin learned after he rushed to the scene. Luckily his own were alive. “I found my children hiding, crying and trembling with other children,” he said. 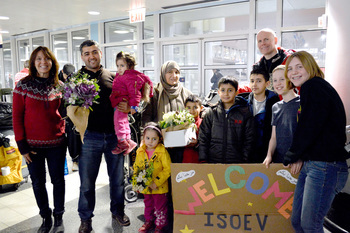 More than two and a half years later, Tadzhidin, Toria, and their children finally arrived in Chicago on January 11, 2016, after obtaining refugee status and being selected for resettlement in America through a rigorous and lengthy screening process. Thus ended a long journey that for Tadzhidin began in his native Tajikistan, a country he left as a university student to study Arabic. Tadzhidin knew only the barest of information about Chicago when, ten days before leaving Turkey, he was informed of his family’s final destination. He quickly began reading about the city on the Internet. He learned that Chicago was an ethnically diverse city famous for its architecture. Tadzhidin and his family are among roughly 4.8 million refugees who have fled the Syrian civil war, an outpouring that has helped push the global number of forcibly displaced people to the highest number ever recorded. President Obama has announced a plan to resettle at least 10,000 Syrians in the U.S. in 2016. While the Congress’ response remains uncertain, RefugeeOne and its community of supporters remain prepared to welcome new arrivals and help them rebuild their lives.